About Us – ME&WE Inc.
Women! We are the essence of life. Women are creators of ideas, dreams and hopes. We support and give more than we are sometime aware of. So now it's time to give back to yourself and other women who need more out of life. To MOTIVATE is to provide yourself with a motive for doing something. To prompt, drive, move, inspire, stimulate, influence, activate, impel, push, propel, spur (on). To EMPOWER is to give yourself the authority or power to do something. To authorize, entitle, permit, allow, license, sanction, warrant, commission, delegate, qualify, enable, equip. To EXCEL is to be exceptionally good at or proficient in an activity or task. To shine, be excellent, be outstanding, be skillful, be talented, be preeminent, reign supreme, stand out, be the best, be unparalleled, be unequaled, be second to none, be unsurpassed or to surpass, outdo, outshine, outclass, beat, top, transcend, exceed, better, pass, eclipse. ME & WE, Inc., was founded by Sonya Sloan, M.D. in 2007. With huge success of its first Seminar in 2009 the movement was incorporated and became a 501c3 in 2011. 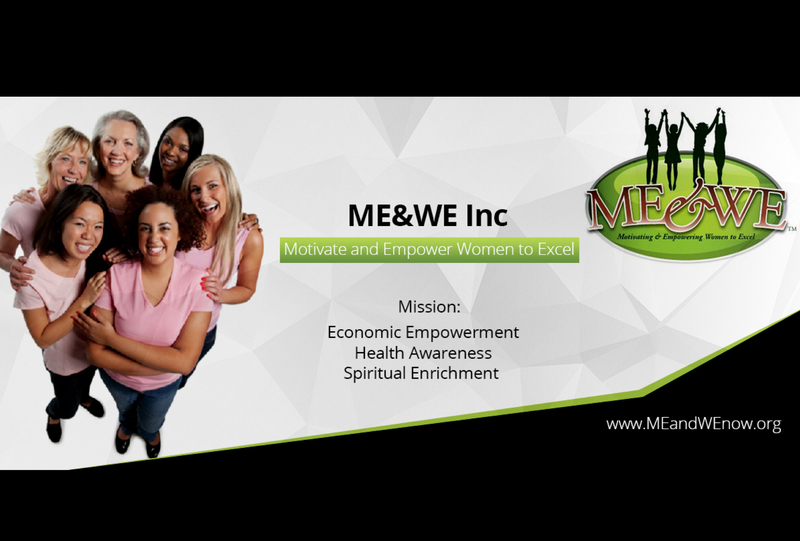 ME & WE, Inc. has a mission to Motivate and Empower Women to Excel through Economic Empowerment, Health Awareness, and Spiritual Enrichment. This organization believes when a woman is Motivated and Empowered (ME), she can and will help other Women to Excel (WE). The circle of self-motivation and self-empowerment will in turn positively impact other women in their communities and society as a whole. Bosses! Women are Motivated and Empowered by Women who are Excelling. So our Board are Women who are just that. Leaders who are passionate and Bosses in their own right!